It looks like time is moving faster and faster every month. I feel like I have written a September report just yesterday and it is already time to write it again for October. I was busy trading (besides my other less loved activities) and dealing with violent markets struggling to find direction. People in Wall Street are torn apart on who has a bigger influence on the future market direction – Fed, Trump, Clinton, weather, or oil, and many pay a little attention to macro and micro economic data coming from the economic and earning reports. At least, I am slowly progressing to a state of being independent from the market direction. It is a beauty of trading options that a trader can make money in any market. You won’t get such privilege with stocks only. October 2016 options trading was successful again. We made money as per the plan. I planned to make $3,500 in premiums in October 2016 and we made $3,446.50 in premiums! Of course, according to the Wall Street earnings obsession we missed earnings this month. If I had a publicly traded company, investors would be spooked and selling our shares like crazy as of now. I am happy for October results. 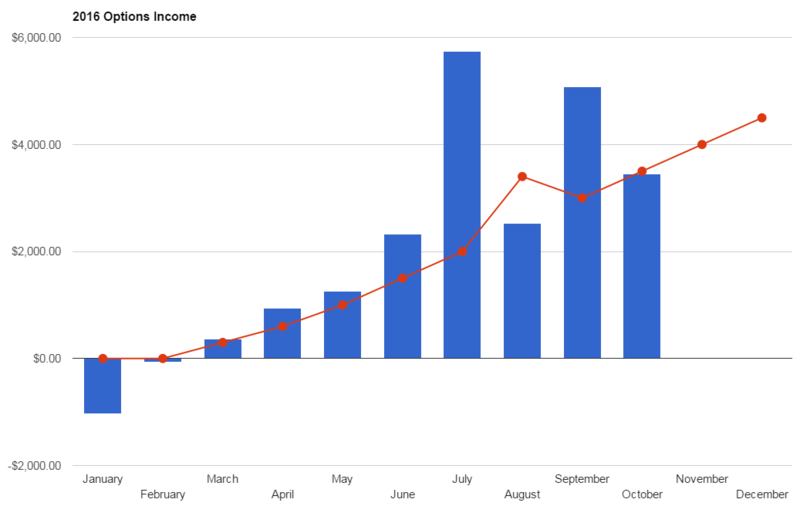 Income wasn’t as good as last month, but within expectations and goals. And that’s what counts. October dividend income came out as a surprise to me. I noticed a few dividend cuts on my MLPs and oil companies (AGNC and COP seemed to lower their dividend), yet my dividend income came larger than previous month. This month, the dividend income was $85.75 which was higher than the last month income of $80.24 dollars. I still have dividend investing a bit dormant as we are now focusing on reaching our options goals which would greatly pay for our dividend investing. That was my plan from the start. Trade options and reinvest income into dividend paying stocks. And we are successfully reaching that goal. Trading in October was once again more on autopilot rather than active trading. I didn’t like it, but I can’t do much about it. Originally we wanted to be opening at least one trade (and contract) per day and this showed up as a mistake. Now our account is over-invested and I am only managing it to keep enough buying power and stay out of the money with the trades (so we do not get a margin call or any similar disaster). Every month I re-position our trades in a hope that that month those trades can either expire worthless or be bought back for a profit. And as soon as I think about it the market gets into a turbulence forcing me to roll those options again and postpone so desired day of reckoning and closing those trades. In September I had a plenty of trades set to expire, many in October to be closed and yet I had to roll them into November, December, and some even into January and March next year. I am not happy about it, I wish I could close those trades for a profit so this constant rolling makes me tired. But this happens and it is a part of our trading plan. I like to roll as long as I get it right. Some investors do not agree with this strategy. They would tell you that if the trade doesn’t cooperate, close it, take the loss and move on. Deploy money elsewhere where it will work. I don’t like taking losses. Once again below is a quick review of all trades we made this month. I also post those trades in real time in our Facebook trading group although lately not much since I am a sitting duck now waiting for our trades to finally end so we can trade again. But when I post a trade I try to write down reasons for taking that trade, our expectations, and a plan for that trade for every possible situation. Sometimes, it is not easy to write about trading (what do you want to say about such a boring topic, right? ), but I do my best so others can learn from it. If you are a member of the group, you can always ask a question what was I thinking. Or you can ask about your own trade if you need help. You can join our Facebook group for free. However, membership in the group is limited to 250 members only. Once all the seats are full new members are admitted only if any old member leaves the group or are removed by administrators. There are also other traders in the group and they post their own trades and ideas, too. They are willing to help and provide their view and input for everyone to learn. You can follow our trades (mirror them), paper trade them, or just watch them and learn. The truth is that I am not trading $13,000 dollars account only. I trade a lot more than that. and our overall initial buying power was a little over $70,000 dollars. I added these numbers to our blog to My Trades & Income section and you can review them there in real time. In fact, we are trading approx. $70,000 dollars account! And thus making $3,446.50 this month is not such large leverage risk. It represents 4.93% of monthly income on the overall available capital. We also use a portion of the monthly revenue to pay the loan off. Our monthly loan payments are $907 a month and the interest rate is 9%. If we make #3,450 a month we make enough money to pay the loan and reinvest the rest. with 4.33% of current monthly income, which is approx. 52% annual revenue, paying a 9% loan is acceptable. In other words, we pay 9% on a loan which allowed us to make 52%. Not a bad deal. From our trading records we can report our average trade holding time to be currently 17 days, average P/L 1.54% and 86.73% annualized return. I am happy to report that we completed our plan of creating an average income of $2,000 per month. That is a great achievement. This was always my dream to trade options to create a regular income. Although I made money in the past (I also lost them) it has never been a consistent and growing income. Finally, we reached this goal and we are generating a consistent income. I am interested in applying for portfolio margin for our account. This would allow us to increase our trading (and leverage) and trade more trades and more often. That would allow me to increase income and start trading for a living as a full time trader. ESV is a waiting game. The stock rallied in September and I had to roll my covered calls higher for which I used a strangle strategy. I got originally assigned to the stock at $11 a share. The stock is trading at around $8 share, but it was as low as $6 a share. That was the time when I was selling covered calls below the assignment price to collect income and improve cost basis. But in September, the stock rallied and at some point it reached $9 a share. I had to roll my 7 strike calls to 8 strike calls and later to 10 strike calls. Since this stock isn’t a very good option trading candidate I had to use strangles to roll my calls. That means I had to be selling puts to offset the price for the calls. Today I sit on a few calls and puts and waiting for them to either expire, be bought back for a profit, or roll them further away in time. Since all those trades have expiration in March 2017 I do not have to do anything with them and just sit and wait. After I got assigned in September to the stock it looked like there was no bottom for LULU to fall to. In October it seems that LULU finally stopped its fall and is building a solid gound and consolidating at around $55 a share. However, the company is reporting on December 1st before market and their report may shuffle all the consolidation around and we may see another violent irrational reaction of Wall Street and the stock may resume its falling. I was very active trading LULU in October. Not because I wanted, but I was forced by ever falling stock. I had a few naked puts and as the stock was falling I had to roll them. Again I used strangles to roll the puts. Here, unlike with ESV, it worked perfectly. I rolled a put and sold a new call against the new put to offset the cost. As the stock continued falling the calls lost value so I could buy them back worthless and I could roll the put again and sell a new call against it. I plan on doing this as long as the stock gets back above my assignment price where I let my calls to be assigned and puts to, hopefully, expire worthless or buy them back almost worthless. MNK was a bit turbulent in October before it finally decided to fall. Now it is in a constant decline. It follows LULU’s trend pattern – down. At first, I had to roll my calls higher. That was before MNK started falling like a rock. I had to roll my $75 calls to $77.50, then to $80 before the stock turned down. Since then I was rolling my puts down – from $65 to $55 and now to $50. The stock also seems to be bottomless. However, if it continues falling I might be able to liquidate my calls for a profit and roll my puts further down. Same as with LULU until the stock stops and find its support. TRGP is also a waiting game. I had $48 puts when the stock started falling. I rolled them to $46 puts and decided to add $50 strike calls to it. So I only did one roll this month and since then sitting on it waiting for the options to lose value so I can close them (the calls for sure, the puts may take a lot longer or I may need to roll them again). Since both trades have expiration in April 2017 I do not have to do anything. I decided to close the trades for a profit this month and currently have no position in PSX. I did it to raise cash as my buying power was getting too low and I was basically closing all profitable positions. PSX was in that state. I also wanted to release money as PSX expiration was in February 2017 (thanks to many rolls I had to do) and I wasn’t willing to wait that long. PSX is not a bad stock so I may be trading it again in the future, mainly when I release (close) some of my WYNN trades. WYNN is a ride. A wild ride. It is sometimes driving me crazy. But I like to trade this stock. It has great premiums, it is volatile, it has nice price swings so it is possible to make nice money. Basically, since I started trading WYNN I collected over $16,000 in premiums so far. Much of that cash is not available yet to take out since I have many open positions, but WYNN has been a great cash cow for me. 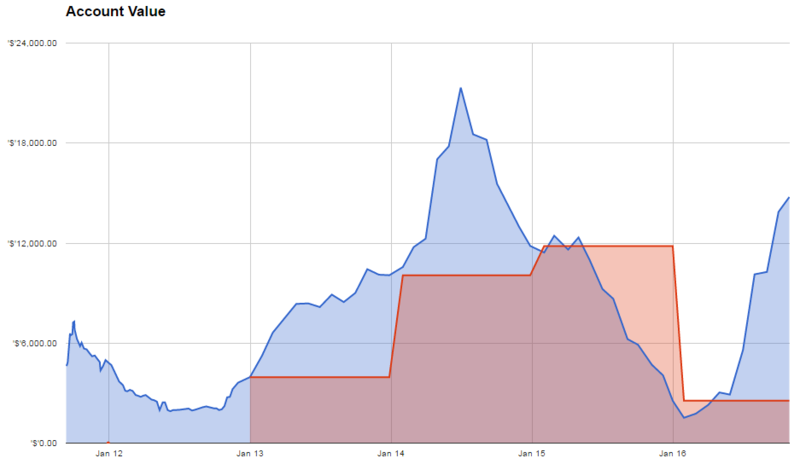 Even during wild moves, the options positions we had in our account held the value of the account stable. I haven’t seen this much with my other trades. Also most of the time the stock was acting uncorrelated to the S&P 500 so when the market was falling, WYNN was going up and I was making money in a falling market. Later on the stock started falling again and I could close many puts and open new calls so I was again making money. This was a brilliant example of my strategy of selling puts and calls and rolling it according to the market or stock behavior. When the stock was going up, I was rolling my calls higher and selling puts against it. Then the puts were being closed for a profit and I could roll calls higher again and sell new puts against it. When the stock reversed, I did the opposite. I started rolling my puts down and selling new calls against it. Then the calls were being back for a profit so I could roll puts lower and sell new calls. My current put/call ratio is 9/13 and I am still closing my calls for a profit. Soon, I hope the stock finds its equilibrium and I will be closing only for a profit. Congrats on another great month. I agree with you on WYNN. It’s volatile enough to be fun for trading. This is a newer trade for me, but I’m enjoying the premiums. Just make sure you do not overtrade it. It can also become a great enemy. Some great options earnings! Thanks for the update, keep them coming! That is a very decent tarding income. Yes, it sounds foreign and scary to many people. I also was scared about it before I took the loan, but then I provided a rationale for it and plan what to do if the trading wouldn’t work and I would be losing money and with that I could do it, take the loan and trade it. So far works perfectly and once I pay this loan off, I will take another one. I will be doing it as long as I grow my account enough that I will no longer need this boost. Good luck investing and trading! where do you get the loan for your trading?! from a bank or your broker? I took a loan some months ago from my brother. It was 20.000 Euro, it works very good. I used a personal loan using P2P lending from Prosper and Lending Club. I also have a margin “loan” from the broker. how do I read the trades? do you write your losses in your trading history? I would say if you have to roll a position to the next month you make a loss in the first month and make the win in the next month. Hi Chri, yes if you look at it that way then all rolls are a loss of the original trade. But I do not look at it that way. I consider a trade open with unrealized loss in the first month and when I close the trade next month then it is a realized gain. In the Trade summary table above all trades with zero P/L and AR% are rolls.